—Photo by Tyler Anderson, The Graphic-Advocate South Central Calhoun’s Zane Neubaum puts up a shot for the Titans. ROCKWELL CITY — While the move to focusing on one sport might work for kids at some schools, that is definitely not the case at South Central Calhoun. 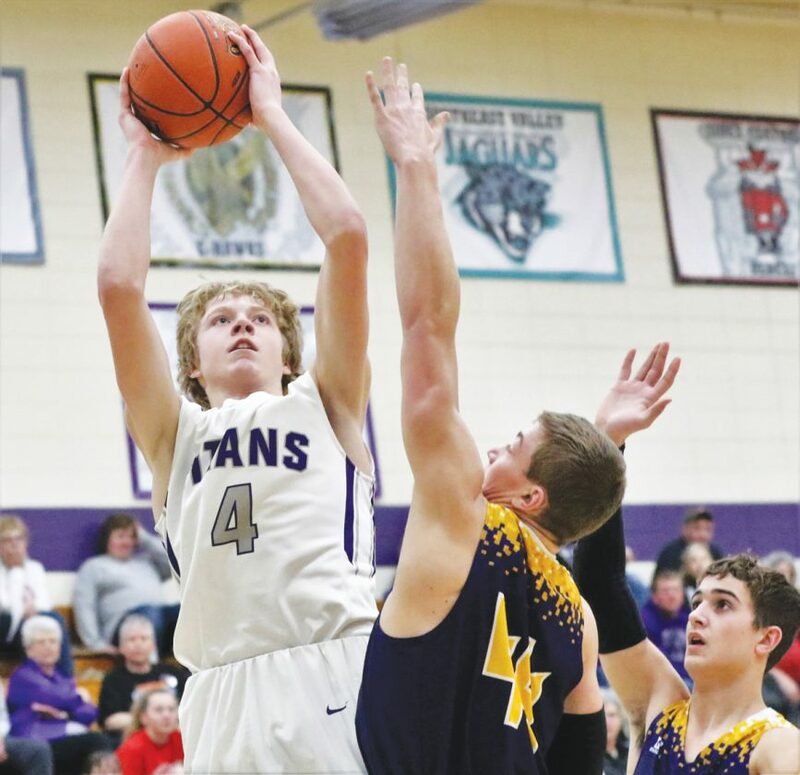 After finding plenty of success on the football field in the fall, the Titans have racked up 19 wins and the Twin Lakes Conference regular season title on the hardwood this year. Many of those same athletes who played on both offense and defense for SCC, have transitioned into the winter including senior Jared Birks and junior Zane Neubaum. Neubaum leads the Titans in scoring with 351 points, averaging 17.6 per game. He is shooting 50 percent from the field and ranks among the team leaders in rebounds, assists, steals and blocks. “I really enjoy all the sports and competing in everything I do,” Neubaum said. “It definitely helps having a lot of friends in all the sports. It makes it much more enjoyable to play together when we all want to win. Right behind the 6-foot-1 Neubaum is Birks, who is second in scoring at 12.0 per game and also near the front of the leaderboard in rebounds, assists, steals and blocks. Seven different Titan players are averaging at least four points per game, as the team is shooting almost 45 percent from the floor. They are also scoring 10 points more per game compared to 2017-18. During the offseason, the 6-foot-5 Birks took advantage of having his sister, current Northwestern College standout Haley Birks, back home to help him develop more offensive skills. The Titans won just eight games a year ago, falling in the opening round of the postseason to league rival Sioux Central. Birks averaged 13 points and had 145 rebounds as a junior, but made the move inside to use his size more to his advantage this year. Like Birks, Neubaum has seen his season averages rise compared to a year ago. He finished his sophomore year shooting 39 percent from the field, boosting that by 11 points this year to 50 percent. “I think I have improved my strength a lot,” Neubaum said. “It allows me to be more explosive, jump higher and make plays that I couldn’t last year. I lifted very hard this last year and I think it has paid off. South Central Calhoun begins district play next Thursday at home vs. either Greene County or Southeast Valley. Points: Zane Neubaum 351, 17.6 ppg. Rebounds: Jared Birks 153, 7.7 rpg.